Monika Wiela was walking to work on Michigan Avenue in Chicago when she passed a homeless man holding a sign that read, “I need shoes.” Wiela desperately wanted to help him. As the founder of online shoe store StyleUpGirl.com, she had a warehouse full of platform heels and stiletto boots – but no men’s shoes. Wiela did, however, have a ton of cardboard shipping boxes, and after ruminating over the man’s dilemma all night, she came up with a solution: What if you could take your old shipping boxes from online retailers and – instead of tossing them into the recycling or garbage – pack them with clothes and household goods you no longer need, and send them to charities? That’s the idea behind Give Back Box, a startup Wiela launched last year after running a year-long test with StyleUpGirl.com clientele. Before shipping a pair of new shoes to customers, the Polish-born entrepreneur placed a prepaid mailing label addressed to a secondhand charity in the cardboard box, along with donation instructions. The result? Thirteen percent of shoppers boxed up their unwanted goods and mailed them off to nonprofit organizations. Now Wiela is working with online retailers Newegg.com and Overstock.com to promote the Give Back Box program to their customers, by including flyers in their cardboard shipping boxes. Prior to officially launching her partnership with Newegg, Wiela ran a pilot program with the electronics retailer and achieved a return rate of 0.5 percent without any real marketing effort, Forbes reported. “This makes us believe that the effective return rate will be around 7 to 8 percent by the end of the year with active participation from online retailers,” Wiela told Forbes in April. But what if you shopped at another online store like Zappos or, the holy grail of online retail, Amazon? Simply visit Give Back Box’s website, print out a free shipping label and start packing your donations. Weila has spoken with Amazon about working together, Forbes reported, but its shipment volumes are too high to handle at this time. Goodwill – the organization that receives all the unwanted clothes and household items from Give Back Box’s participants – pays for the costs of shipping as a way to increase its donations, according to Fast Company. "When I started talking to Goodwill, they told me their biggest challenge is a lack of donations. People are busier and busier and they don't have time to drive to the store," Wiela told Fast Company. "At the same time, the big online retailers have a sustainability problem. They don't want to see a lot of boxes in landfills. This is a beautiful solution, because it is win-win for everyone." 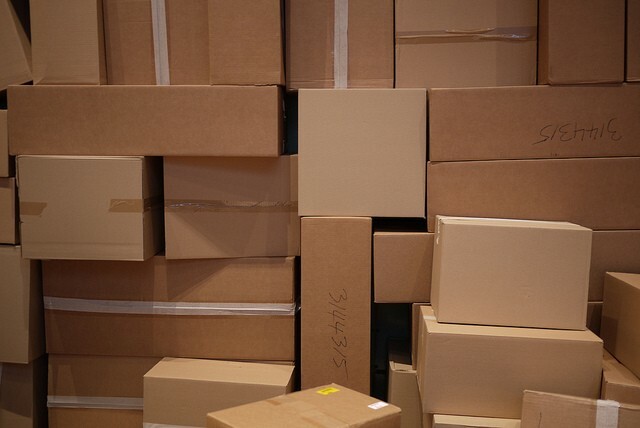 With the motto “No box left behind,” Give Back Box is a win-win: Americans go through almost 30 million tons of cardboard every year, according to the Environmental Protection Agency. Amazon alone ships more than 4 million boxes every day, Forbes reported. To our credit, we’re good about recycling these boxes: The EPA says 91 percent of cardboard was recycled in 2012. But no matter how high the recycling rate, it’s still environmentally preferable to use these shipping boxes a second time before they’re recycled – just as the waste reduction hierarchy taught us: Reduce waste first, then reuse it and finally, recycle it. The fact that Give Back Box is channeling more donations to Goodwill – and further increasing reuse – as it gives cardboard boxes a second life only boosts its cause. Wiela told Forbes she plans to grow Give Back Box, setting up new partnerships with additional charities and retailers. She is also exploring non-retail shipments such as person-to-person Federal Express boxes and U-Haul moving boxes. Give Back Box is responsible for over a thousand donations so far, Fast Company reported, and here’s hoping the initiative only continues its success.